Kenny and I put 45% of our income from November into savings, which we’re pretty proud of. Don’t worry; because this isn’t a personal finance blog, I won’t break down every last little detail. But, as an aside, I really really love PFBs. It’s the geeky side of me coming out again. But since this is the blog about my life, I do occasionally like to share some of the ways I save money without going (too) crazy. Yes. My law-school-student husband made this for me. Nevermind that it is exam week. #shakesheadaffectionatelythenchowsdown. He is handsome and he bakes. I am so blessed. I had just come from Meijer, where I got these delicious foods at great prices. If you’re interested in how, read on. And if you have any holiday entertaining to do, you should be interested and you should read on, because these would be great baked goods to take to a party. I’m not sure if the Red Velvet cupcakes will make it out our door, though. They look scrumptious. Though these deals are specific to this week (12/9/12-12/15/12) and to Meijer stores, the same principles can be applied to most grocery stores at any time. If Meijer is not your preferred grocery store, Google your store name, the date, and “coupon matchups”–hopefully you’ll find some helpful bloggers out there catered to your store. Krusteaz Cookie Mix is on sale for $1.59. The box claims it makes 3 dozen cookies, so it probably makes about 12 Bauman-sized cookies. 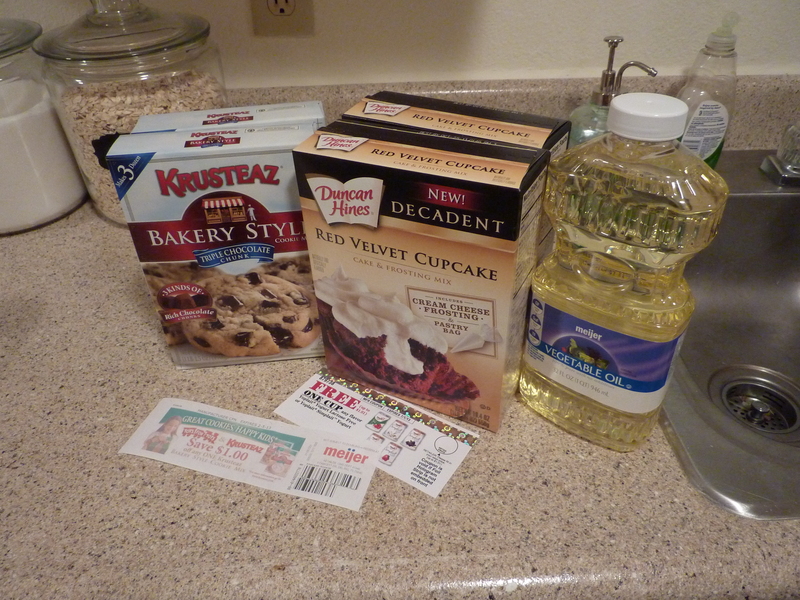 Get a $1/1 Krusteaz Cookie Mix printable coupon HERE (when you click on the link on the page). You can usually print 2 coupons from most websites by accessing the link twice, so I did that with this coupon. Total: $.59! And, when I scanned the boxes at the register, out printed the coupon you see in the picture for another $1 off, so I’ll go back later this week and pick up another one! And Kenny and I will just live happily off baked goods forever! Duncan Hines Decadent cake mix is on sale for $2.50 (actually 2/$5, but at Meijer that does not mean you have to purchase 2 to get the sale price). If you have an MPerks account (Meijer’s online coupon clipping program), you can “clip” a buy 1, get 1 free coupon for this product. You’ll type in your MPerks account number on the self scanner or credit card machine at checkout to redeem this. That in and of itself is a great deal, but it gets better: this week, when you purchase 2 boxes of this cake mix, you can get a FREE 32oz Meijer brand Canola or Vegetable Oil bottle! The savings will come off automatically at the register. Don’t do like I did and accidentally grab the 48oz bottle and have to trek from the cash register across the store in uncomfortable wedges to fetch the right size. I also picked up 2 frozen Jack’s pizzas (on sale 4/$9 or $2.25) and used 2 $.75 off coupons (that can be printed from here), making each $1.50. When I got home, I checked my mailbox on the way into our apartment and had a coupon for free Yoplait yogurt waiting in there that I’d signed up for a few weeks ago! Yum. And then, I went on the internet and discovered that you can get a coupon (actually 2, since you can usually print 2 online coupons each time) for $3 off 3 Smart Balance products here when you send ecards to 3 Facebook friends (send one to me if you want! ), and Meijer has Smart Balance Spreadable Butter with Canola Oil on sale for $.99. WHICH MEANS THAT YOU CAN GET 3 FOR FREE. FOR FREE. That is, if you’re not morally opposed to anything that isn’t quite real butter. I love grocery shopping. If you want to see other Meijer deals for this week, go here. See? Saving lots of money on delicious food is easy. You don’t have to become a crazy coupon lady like me (I place myself into that category because I own and rock a coupon wallet that fastens with velcro)–you can just be awesome and keep more of your own money. And you know I’m all for that. Now, go forth and save. Want to learn how we’re saving a BUNCH of money on Christmas presents this year? See this post on using Swagbucks. Also, check out this post if you have a birthday coming up! Categories: Cooking, Great Deals, Shenanigans | Tags: Coupon, coupons, duncan heinz, Grocery store, krusteaz, Meijer, mperks, sales, savings | Permalink.